Truth be told, I make a pretty good apple pie. I’ve made a few now so I’ve had opportunities to tweak it to my liking. Just recently I also figured out one of the secrets to a flaky crust (don’t overwork the dough – if it seems like it’s not blended enough, don’t worry – it is!). 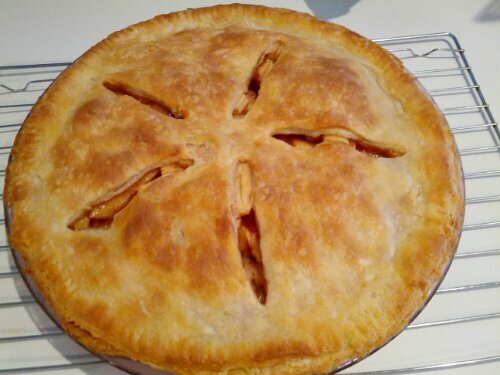 This is a picture of one of my apple pies. Since I was confident in my standard apple pie, I felt like I should step it up. I decided a streusel top would be a nice change. I’ve never made a streusel top on anything before but I know basically what goes in them… Flour, sugar, butter, spices according to what you’re making. While my pie was baking it smelled so good, I was excited to try it! 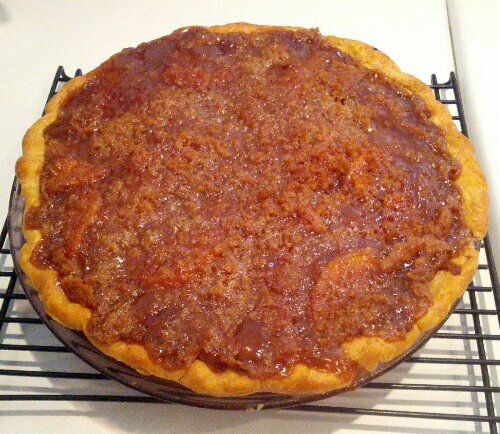 You could smell the brown sugar, cinnamon, nutmeg, apples, butter, oh yum! The thought never crossed my mind that you could make a streusel top too sweet! Well mine was… to the point it took over and you couldn’t even tell there were apples in the pie! I mean, it’s not completely terrible – it IS edible, but I didn’t want the streusel topping to be the star of the show – I just wanted it to enhance my pie. I will try a streusel topping again – but the next time I will probably look up a recipe… For anyone out there who may be wondering, the correct ratio is NOT 1/2 cup flour, 1/2 cup granulated sugar, 1/2 cup brown sugar, 1/2 cup butter! (I don’t know why I thought those amounts seemed right!) Also, I put the topping on before I baked the pie because I felt like the flour in it should be cooked – but I’m not sure if that’s a real streusel. Streusel coffee cakes seem to have a crumbly topping but mine was crunchy. I will need to research. This is a picture of my Streusel-topped Apple Pie (or perhaps it’s not a Streusel-topped Apple Pie!). Have no fear if you make a pie with a topping that’s too sweet – children do not mind at all!